Match ends, Portland Thorns 2, Chicago Red Stars 0. Second Half ends, Portland Thorns 2, Chicago Red Stars 0. Attempt missed. Christen Press (Chicago Red Stars) right footed shot from outside the box misses to the left. Assisted by Katie Naughton. Attempt missed. Mallory Weber (Portland Thorns) right footed shot from the right side of the six yard box is close, but misses to the right. Assisted by Hayley Raso. Attempt saved. Christen Press (Chicago Red Stars) right footed shot from the centre of the box is saved in the centre of the goal. Assisted by Jennifer Hoy. Corner, Chicago Red Stars. Conceded by Dagny Brynjarsdottir. Substitution, Chicago Red Stars. Katie Naughton replaces Casey Short. Attempt missed. Danielle Colaprico (Chicago Red Stars) right footed shot from outside the box is close, but misses to the right. Assisted by Sofia Huerta. Attempt missed. Tobin Heath (Portland Thorns) left footed shot from outside the box is too high from a direct free kick. Allie Long (Portland Thorns) wins a free kick in the attacking half. Substitution, Chicago Red Stars. Jennifer Hoy replaces Alyssa Mautz. Substitution, Portland Thorns. Dagny Brynjarsdottir replaces Amandine Henry. Attempt saved. Tobin Heath (Portland Thorns) left footed shot from the right side of the box is saved in the bottom left corner. Assisted by Katherine Reynolds with a cross. Attempt missed. Christine Sinclair (Portland Thorns) right footed shot from the centre of the box is close, but misses to the right. Assisted by Amandine Henry. Attempt saved. Lindsey Horan (Portland Thorns) header from the centre of the box is saved in the bottom left corner. Assisted by Katherine Reynolds. Corner, Portland Thorns. Conceded by Danielle Colaprico. Foul by Julie Johnston (Chicago Red Stars). Michelle Betos (Portland Thorns) wins a free kick in the defensive half. Attempt missed. Casey Short (Chicago Red Stars) right footed shot from the left side of the box is close, but misses to the left. Assisted by Amanda Da Costa with a headed pass. Attempt missed. Sofia Huerta (Chicago Red Stars) right footed shot from outside the box is close, but misses to the left. Assisted by Christen Press. Attempt missed. 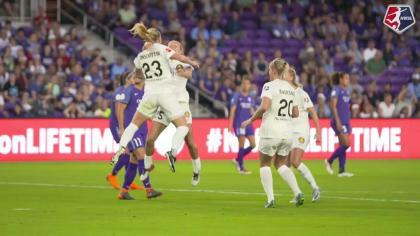 Emily Sonnett (Portland Thorns) header from the centre of the box is too high. Assisted by Tobin Heath with a cross following a corner. Attempt missed. Alyssa Mautz (Chicago Red Stars) right footed shot from the right side of the box misses to the right. Attempt blocked. Christen Press (Chicago Red Stars) right footed shot from outside the box is blocked. Assisted by Danielle Colaprico. Attempt missed. Amandine Henry (Portland Thorns) right footed shot from outside the box is just a bit too high. 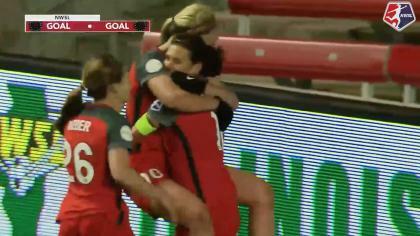 Assisted by Tobin Heath. Nadia Nadim (Portland Thorns) wins a free kick on the right wing. Attempt blocked. Danielle Colaprico (Chicago Red Stars) right footed shot from outside the box is blocked. Attempt missed. Sofia Huerta (Chicago Red Stars) right footed shot from outside the box misses to the right. Assisted by Danielle Colaprico. Goal! Portland Thorns 2, Chicago Red Stars 0. Nadia Nadim (Portland Thorns) header from very close range to the top left corner. Assisted by Amandine Henry with a headed pass following a corner. Attempt missed. Amanda Da Costa (Chicago Red Stars) right footed shot from the centre of the box misses to the left. Danielle Colaprico (Chicago Red Stars) wins a free kick on the left wing. Attempt missed. 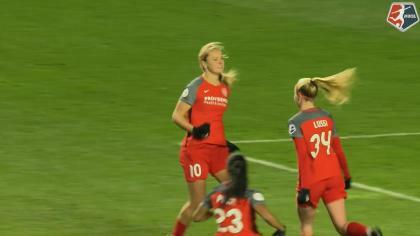 Lindsey Horan (Portland Thorns) header from the centre of the box misses to the left. Assisted by Katherine Reynolds. Attempt missed. Lindsey Horan (Portland Thorns) header from the centre of the box is close, but misses to the left. Assisted by Emily Sonnett with a cross following a set piece situation. Offside, Chicago Red Stars. Vanessa Di Bernardo tries a through ball, but Sofia Huerta is caught offside. Attempt saved. Vanessa Di Bernardo (Chicago Red Stars) left footed shot from outside the box is saved in the top left corner. Assisted by Casey Short. Sofia Huerta (Chicago Red Stars) hits the left post with a right footed shot from outside the box. Attempt missed. Amandine Henry (Portland Thorns) right footed shot from the centre of the box is too high. Assisted by Tobin Heath with a cross following a corner. Goal! Portland Thorns 1, Chicago Red Stars 0. Christine Sinclair (Portland Thorns) right footed shot from the right side of the box to the bottom left corner. Hand ball by Lindsey Horan (Portland Thorns).